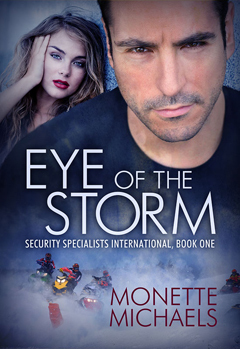 Eye of the Storm is now in print! Just in time for Christmas, the first book in the Security Specialists International series is in print at CreateSpace eStore and Amazon.com. It is a 5 x 8 trade paperback with 364 pages and costs $13.50. Keep an eye on this blog for a surprise Christmas present from me to all my fans: a free download of the first SSI novella, which will fit into the timeline between Eye of the Storm and the second SSI book, Cold Day in Hell, which is currently in edits. And for my Prime Chronicles fans, yes, I am working on the second book in that series. ~ by Monette Michaels on December 5, 2011. Congrats! Way to go, and I like your cover.